^ Office of the Inspector General, U.S. Department of the Army (January 2001). No Gun Ri Review. Washington, D.C.: U.S. Department of the Army. pp. x. http://en.wikisource.org/wiki/U.S._Department_of_the_Army_No_Gun_Ri_Review_Report 2012年8月28日閲覧。. ^ Committee for the Review and Restoration of Honor for the No Gun Ri Victims (2009). No Gun Ri Incident Victim Review Report. Seoul: Government of the Republic of Korea. pp. 277-281. ISBN 978-89-957925-1-3. 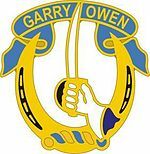 1st Cavalry Division - Army Modular Forces Webpage explaining division's transition to new modular organisation, along with new order of battle. United States Army Center of Military History; CMH Publication 60-1; "Army Lineage Series: ARMOR-CAVALRY, Part I: Regular Army and Army Reserve." Library of Congress Catalog Card Number 69-60002. Shelby L. Stanton; ORDER OF BATTLE: U.S. ARMY, World War II; 1984; Presidio Press; ISBN O-89141-195-X. Cavalrymen photos-Pictures of the cavalry during Custer's Last Stand Reenactment.